Billy loves my fish tacos and probably request them every other week for dinner, so I thought tonight would be a great night to treat him since he’s been working in the yard all day! The fish is great grilled on the BBQ or you can bake it in the oven @ 400 degrees for 20 minutes. Which ever way is easiest at the time, both ways produce amazing flavor. Enjoy! 1. 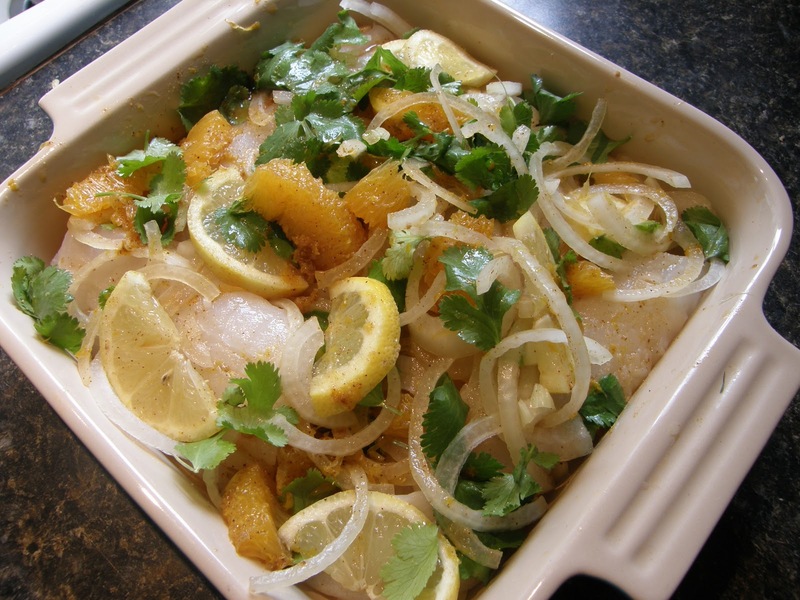 Place the fish in a baking dish. 2. Sprinkle the sliced onion and cilantro over the fish. 3. Mix all the other ingredients in a bowl, mix well and pour over fish. 4. Marinate the fish in the fridge, covered. No longer than 8 hours, toss around the fish 1 or 2 times during the time it’s marinating. 5. To cook, either on the barbecue or in the oven @ 400 degrees for 20 minutes.